Interesting study worth reading. Long-range "food for thought" as generational shifts change the nature of participation in the workplace as well. What engagement models transfer, etc. Some valuable points made in this article - including issues related to social identities ("multiple 'selves'"), social structures and structural holes (attempts to segment relationships), and role conflicts. OK, so that product does not exist - not today, and perhaps not even tomorrow (in a SharePoint 2010 timeframe). But it should. Windows Live Writer is perhaps the best tool for offline composition and publishing of blog posts to a variety of back-end blogging services. As Microsoft begins its marketing campaign for SharePoint 2010, one of the key focus areas will be social computing. This should come as no surprise since it clearly is an area where Microsoft needs to demonstrate dramatic improvement to just keep up with the competition (e.g., Jive, IBM, Telligent and a host of best-of-breed vendors). Note: I'm not talking about Microsoft moving ahead in terms of functionality - just improving in a "good enough" way to leverage it's other strengths with decision-makers (e.g., common infrastructure, common development, common operations, etc.). One area where Microsoft could show some level of innovation could be content authoring - which brings me back to Windows Live Writer (a tool I use extensively). You could argue that Word could be used as well - but the user experience of Live Writer is just a lot more effective - it does exactly what it is intended to do without carrying a lot of other baggage for a content experience that I'm not interested in (traditional office documents). Microsoft could simply re-brand the tool (e.g., Windows Live Writer for SharePoint) but I think a specific version with extensions that make it more appealing to SharePoint environments (e.g., security, compliance, role-based templates, integration with workflow, lists, etc.) could help alleviate some management concerns regarding employee blogging. So another "thinking out loud" post ... but in general, internal product teams at Microsoft need to leverage innovative work being done by other teams (that might be considered consumer-centric). For instance, what does a tool like Vine, a notification service that behaves in a Twitter-like fashion, have on Microsoft's OCS platform? Can Microsoft recast some of the underlying tooling to develop an enterprise version? As Microsoft moves from on-premise to cloud/SaaS instantiations of its products - will market perceptions shift in terms of interoperability expectations between its consumer and enterprise products and services? I think they will (digital life trumps digital work so to speak - interoperability will be a default assumption by a next generation workforce). Right now, given internal team structures and organizational boundaries - Microsoft is not prepared to leverages those opportunities (in my opinion). Which is why I'm doubtful the Windows Live and SharePoint teams could coordinate effectively to delivers a SharePoint Writer idea to market. Suppose you shoot video using your Flip Mino or MinoHD, and then plug it into your computer – what if the USB-based software included the WebEx/UC components so you could not only just upload the content to a social network site or video sharing site but also to a WebEx web conference or to a virtual workspace (i.e., WebEx Connect)? Could Cisco squeeze the WebEx software and some of the IP telephony software on the Flip USB so you could participate in a conference and have a VoIP call to discuss the video? UPDATE: twitter.com/aewang offer a great idea. "I can see Cisco create integration pt btwn Flip and WebEX, DMS, and its new collab platform. Make it super easy to publish video"
I had not thought of the DMS connection. Flip could be another front-end to a Cisco "Corporate YouTube"? Cisco Systems went through with its head-scratcher of an acquisition, announcing on Thursday the purchase of Pure Digital for $590 million in stock. 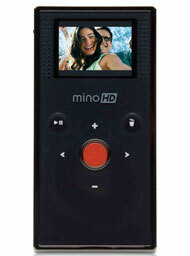 Pure Digital’s 3.3-ounce Flip Mino HD camcorder. While you may not recognize the Pure Digital name, there’s a decent chance that you’ve run across its Flip Mino products. They’re the tiny digital video recorders that come in a variety of colors and make taking some video, slapping it on your computer and sending it to the Web about easy as it can be. Rumors of Cisco’s interest in Pure Digital started to appear a couple of weeks ago, and most of the people I talked to couldn’t quite figure this one out. CS: Oh, those are the stupidest people in the entire debate because they, I mean, almost all of the people arguing that this is the Dark Ages are narcissists, because they’re essentially trying to preserve a particular piece of it. But the information overload people are the most narcissistic because information overload started in Alexandria, in the library of Alexandria, right? That was the first example where we have concrete archaeological evidence that there was more information in one place than one human being could deal with in one lifetime, which is almost the definition of information overload. And the first deep attempt to categorize knowledge so that you could subset; the first take on the information filtering problem appears in the library of Alexandria. RJ: So, is this just a generational thing? That younger people have come up using these filters and these technologies and they love it and the older generation is just kind of scared? CS: Yeah, that’s certainly part of it. I mean, the thing that people say about young people is just that they understand the technology so well. Well, I teach in a graduate program, I see twenty-five-year-olds all the time. They actually don’t understand the technology particularly well. I think I understand quite a lot of it quite a bit better than they do, which is the reason why I’m teaching there and they’re students. The advantage they have over me is that they don’t have to unlearn anything. They don’t have to unlearn the idea that a card catalog is a helpful thing to have. That you need a librarian to find things. That you have to figure out where you’re looking before you what you’re looking for. None of those things are true anymore. And so one of the problems that old people like me suffer from is just we know too many solutions for problems that no longer exist. And it kind of freaks us out to realize that all the things we mastered don’t really add up to much value anymore. Russ Juskalian: Well, this kind of brings me to something. We’ve heard all the consequences of what will happen because of information overload or attention spans. But, when you were talking about the last couple of things, I started wondering. Can you think of any of the consequences that would come about as a result of trying to stem the so-called information overload, or trying to slow down all of these things as they come? Clay Shirky: So, there’s two different possibilities here. Stemming the information overload is this ridiculous Luddite fantasy of somehow, you know, making all those bloggers shut up so that there’s not so much stuff to read. You know, going back to the day when one could have said that you had read or watched the news, as if there was exactly one hour of news per day. I mean it’s just, you know… even, as an experiment, if you said “I’m going to only read the RSS feeds of news sources that existed prior to 1990,” you would still be drowning in it, because you can get to every English language newspaper in the world. So even if you just dealt with the fact that all this production is now global—forget any new entrants, forget amateurs at all—access to professional information is now so far in excess of what it was in 1990 that you still have that problem. So I don’t think that there are any rollbacks. What I do think is potentially quite interesting is all of the work on filtering that says a big part of the value of information is actually downstream from its production. I would like to be reading or talking about what my friends are reading or talking about, or my colleagues are reading or talking about, or my competitors are reading or talking about. And this rise of social filtering—there’s an interesting phenomenon in the university world, where the number of papers jointly published by two or more researchers working in different institutions is on the rise. And it’s on the rise because it’s very… sitting at your desk, it’s almost easier to figure out, “Who else [in the world] is working on what I’m working on?” than to figure out, “What are my colleagues down the hall working on that isn’t like what I’m working on?” And that idea of information weakening the walls of the institution seems to me to be really beneficial for cross-disciplinary work. I mean, I think the fact that many of the people doing behavioral economics are psychologists is indicative of the kind of cross-disciplinary work we can potentially hope for in the future. So, I think that one of the ways to get around this filter failure problem is—you know, I refuse to use the term ‘information overload’ for obvious reasons—is to start deploying these social filters that assume that at least part of why I want to read or look at something is to be able to have valuable thoughts or conversations in tandem with other people. And I think that when we start to see those kinds of conversational groups form in the kind of salon culture, particularly in university communities, we will see a potential transformation not of just whole academic institutions but also individual disciplines, where the econo-physics people, the behavioral economics people, and the neo-classical economics people are all now having a conversation that cannot be resolved with reference to only one of those three disciplines. And that potential for saying, “You know what, we’re going to give up on any idea that one can have read the ‘relevant literature’ now,” because a lot of that was just artificial barriers around the filter. And, instead, we’re going to say, “I’m reading the literature that’s keeping the conversation I’m having kind of the most interesting it can be.” That seems to me a potential way out of the current filter failure problem. Social Networking: For Better Or Worse? Two little words — “social networking” — have become a giant buzzphrase over the past couple of years, what with the worldwide march of Facebook and headline-ready stories about Web-assisted suicides. So what’s the net effect of social networking? Has social networking technology (blog-friendly phones, Facebook, Twitter, etc.) made us better or worse off as a society, either from an economic, psychological, or sociological perspective? Unlike other research available, the Connectivity Scorecard measures usage and skills such as literacy, the use of enterprise software and the accessibility of women to ICT. It also articulates the benefits of connectivity explicitly in terms of economic and social contributions taking into account varying needs in different countries. Economic growth of innovation driven economies depends on new ways of using connectivity, whereas for efficiency and resource driven economies social development plays an important role in getting the most from connectivity investments. The study shows that even the world’s best connected countries such as the Unites States and Sweden are not exploiting communications technologies to their fullest potential. Given the room for improvement on multiple measures of connectivity, there is every reason to believe that the worldwide gain from improving connectivity could be significantly higher.